Large companies have seen a 27% increase in internal theft. 7 percent of their revenue is being lost to fraudulent activities annually! Management accounts for up to 37% of all frauds recorded. It takes about 2 years to detect office fraud. An average of 1 out of every 30 retail employees are arrested for theft at the workplace. Of all the employees recorded, statistically men steal more often and steal more. Men stole an average of $250,000 and 59.1% of the men surveyed said they stole from their employers. Women were much less at $110,000 and only 40.9% fessed up. Education levels were a surprising factor as well, and while the employees with the highest degrees were least likely to steal, they took the most at a time. The U.S. Chamber of Commerce reports about 75% of employees steal from the workplace and most do so repeatedly! One third of bankruptcies in corporate America are directly caused by employee theft. 20% of every dollar earned by a U.S. Company is lost to employee theft. 60% of inventory losses are caused by employees. 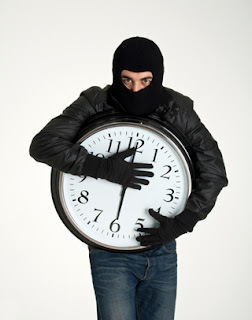 Time theft can destroy your company's productivity...and Profits! The Boston Globe and Denver Post report that "time theft" and loafing cost U.S. companies over $400 Billion a year in lost productivity. Employee time theft costs as a result of buddy punching, early or late arrivals, and long breaks or meals are estimated to be $98 billion in the U.S. alone. Time spent surfing, shopping, or just checking up on their Facebook can steal enormous amounts of billable time. Late arrival or early departure. Taking long lunch hours and breaks. Requesting paid sick days for inappropriate reasons. Slowing down the work pace to create overtime. Excessive socializing and personal telephone calls. Handling personal business while at work. Using Company time and facilities to operate another business. governmental agency. It occurs in every organization with a payroll. Payrollbuilder is an online payroll service, which makes it simple to use and easy to access. To employers who have workers out on work sites, with a single purchase you can have your employees clock in from their phones and you will be alerted to where exactly they where when they clocked in. We protect your wages and follow all the tax laws to the fullest extent. We want to serve the Natural State, and are ready to serve you in Fort Smith, Little Rock, Russellville, Fayetteville, and everywhere else in Arkansas and the U.S.